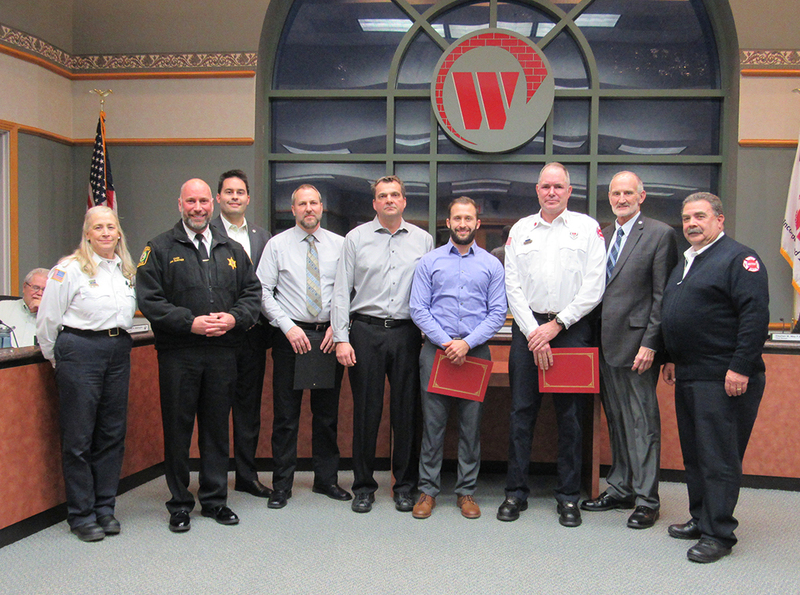 Westmont Fire Department EMS Director Lynn Dralle and Police Chief Jim Gunther recently presented several Life Saving Awards for a May 12, 2017 call in which a combined effort from citizen bystanders as well as police and fire personnel resulted in saving a life. Life Saving Award recipients included Lt. Thomas Bills, Medic Ryan Ferry, Medic Marco Montaini, Medic Martin Dwar, and Firefighter John Moll from the Westmont Fire Department as well as Detective Schneider and Officer Broda from the Westmont Police Department. Westmont citizen Kevin Siewak, who is an employee of the Westmont Park District, and resident Austin Gorman also received Life Saving Awards. The Village of Westmont thanks everyone involved in this life saving effort.